Red Lake County has a rich and varied history in which the Red Lake and Clearwater Rivers have played a central role. These rivers provided the proper habitat for a wide range of wildlife. Over two hundred years ago this wildlife attracted the Chippewa (Ojibway) Indians who were following the fur trade business west from the great lakes region. By 1798 Jean Baptiste Cadotte had established a trading post near the junction of the two rivers in or near the present day Sportsman's Park in Red Lake Falls. As oxcarts began crossing the area while transporting goods between St. Paul, Minnesota to the south, and the Selkirk or Red River Colony (present day Winnipeg, Manitoba, Canada) to the north, the "Old Crossing" of the Red Lake River near Huot, Minnesota, became a place of historical importance. At this site in 1863 a peace treaty was signed between the Red Lake and Pembina bands of the Chippewa Indians, and the U.S. Government. This treaty ceded to the United States nearly 11 million acres of some of the most fertile land in the world. In 1876 Pierre Bottineau, the famous Metis (of mixed French and American Indian blood) guide, brought the first settlers to the area, 119 families of French Canadian descent who founded the towns of Red Lake Falls and Gentilly. Settlers of European descent followed, attracted to the same waters that attracted the Indians and trappers before them. Newspapers of the time advertised the abundant supply of water power provided by the two rivers. These same waters still maintain their powers of attraction as vacationers come each summer to enjoy the beautiful scenery while floating in inner tubes on the Red Lake River . This self tour is divided into two parts Western Red Lake County and Eastern Red Lake County. Each part will take two to three hours and will cover approximately 40 miles designed to introduce you to the diverse and interesting history of the area. There are a total of 25 "stops" at which you will learn of the geology, geography, exploration and settlement of the area. Relax and enjoy the beauty of the area as you journey into the past. Red Lake Falls was named after the rapids and falls within the city on both the Red Lake and Clearwater rivers. The battle to form Red Lake County followed by the fight to name Red Lake Falls rather than Thief River Falls as the county seat, provides an insightful look into pioneer politics in Minnesota. Red Lake County was carved from Polk County in 1896. This courthouse, which originally was topped with a large central dome, was built in 1910 just as Thief River Falls was successfully fighting to form its own county (Pennington). The building once had a large central dome that was removed in 1947 because it had taken a tremendous beating from the elements resulting in serious leakage. The courthouse is significant for its central role in the affairs of Red Lake County and for its distinctive style and location. Its hilltop setting and its good integrity make it the most imposing building in the county. It was for these reasons that the courthouse was entered into the National Register of Historic Places in May, 1983. Please walk in and take a look around (enter from the east). A replica of the Statue of Liberty, once housed in the Courthouse dome, is now on display in the rotunda. The building is open during normal office hours, Monday through Friday. DlRECTI0NS: From the courthouse go back to Highway 32, turn north (left)and go one block to Bottineau Avenue. Turn west (left), go one mile then turn left into the Sportsman's Park. The first trading post in the area was erected near this site, at the junction of the Red Lake and Clearwater Rivers, by Jean Baptist Cadotte Jr., an employee of the Northwest Fur Trading Company. (The actual site is unknown but believed to be across the Clearwater river from The Al Buse Sportsman's Park.) We know that Cadotte spent the winter of 1797-98 here from the writings of David Thompson, a geographer and surveyor who took shelter in the cabin during a spring snow storm (1798). Thompson wrote: "Mr. Baptiste Cadotte was about thirty-five years of age. He was the son of a French gentleman by a native woman, and married to a very handsome native woman, also the daughter of a Frenchman. He has been well educated in Lower Canada and spoke fluently his native language with Latin, French and English. " Codotte Jr. is given credit for completely opening to the fur traders the region north of the upper Mississippi. DlRECTIONS: From Stop #2, return to Highway 32, and turn south (right). The Perrault School is on the west (right) side of Highway 32, four miles south of Red Lake Falls. The Perrault School, District #32, was one of six in Lake Pleasant township of Red Lake County. Classes were taught here for 68 years (from 1880 to 1948) when the district was consolidated with that or Red Lake Falls. In 1901 District #32 had Josephine Kaus as a teacher with thirty- one students. Her salary was $30.00 per month. The school building has served as the Lake Pleasant Town Hall since 1881. The school house has been restored as an interpretive center for early American schools. Please have a look around. The building is locked but you can get a good look through the windows. Local teachers bring their classes to the Perrault School to spend a day "as it used to be". The Perrault School and the nearby former Perrault Station on the Northern Pacific railroad was named after Charles Perrault, a homestead farmer in the area who died in 1915. Lake Pleasant township was named for a former lake and marsh in its section 18, now drained. DIRECTIONS: From the Perrault School continue south on Highway 32 one mile then go west (right) on county Road 14 (gravel) five miles. Stop on ridge just past a small stream/gully. This ridge was once the shoreline of a large body of water known as Lake Agassiz. Over 10,000 years ago glaciers extended as far south as Iowa. As they receded, Lake Agassiz was formed when run off from the melting glaciers was blocked to the north by the glacier. (All rivers in this area drain into the Red River then north to the Hudson Bay. ) Lake Agassiz was huge, extending from well into Canada as far south as present day Breckenridge, Minnesota and east past Upper and Lower Red Lake. Water from this lake drained to the south via Glacial River Warren through whose valley flows the present day Minnesota River. The several successive levels of Lake Agassiz are recorded by distinct and approximately parallel sand ridges indicating the ancient shorelines. Some of these ridges provided excellent natural roadways for the Red River oxcarts. At this point the Pembina Trail (Stops # 5 and 7) crossed the ridge on its way to the Old Crossing of the Red Lake River. Stop your car on the ridge, get out, and try to imagine the glaciers, Lake Agassiz and the oxcart trains which followed them thousands of years later. CHANGE directions DIRECTIONS: Continue on to County Road 11 and go east to County Road 3. Turn west (left) on County Road 3 and go one half mile to the bridge over the Red Lake River. This bridge is located just downstream of the site of the Old Crossing, where from 1844 to the 1870s thousands of ox- drawn two wheel carts crossed the Red Lake River while hauling goods between St. Paul, Minnesota, and the Red River Colony (Winnipeg, Manitoba, Canada). This particular trail became known as the "Woods Trail" because of the forested areas south of present day Detroit Lakes through which it passed, but is known locally as the Pembina Trail. The Woods Trail which passed entirely through lands once controlled by the Chippewa Indians became popular to oxcart drivers when the more westerly trail, along the Red River in North Dakota, came under attack by the Dakota Sioux Indians. DlRECTIONS: Continue across the bridge and turn north (right) immediately. At the next intersection turn east (right). Look for the shrine on a hill on the north (left) side of the road. Turn right into the Old Crossing Treaty County Park just BEFORE the shrine steps. This shrine was built by Father Ernest Bossus, pastor of St. Dorothy's Catholic Church from 1926 to 1935. The roots of St. Dorothy's Parish go back to the Huot area, where Father Pierre Champagne offered mass at the home of Louis Huot as early as 1880. At that time there were about 25 Canadian families located in the area. A church, St. Aloysius, was built at Huot in 1883. In 1919 a new church was built in the village of Dorothy (5 miles north) and the St. Aloysius Church was closed. Father Bossus' sight failed in his last years at Dorothy but his eyesight was successfully restored by a cataract operation. In thanksgiving, he built a shrine in honor of the Blessed Virgin on this knoll across the road from Huot State Park. Dorothy's parishioners still gather annually for services at the Shrine. This marker is on the site of the Woods (Pembina) Oxcart Trail. If you can brave the mosquitoes, you can see the indentation of the actual trail through the woods ahead of you (see map). DlRECTI0NS: Continue through the park to the boat ramp on the Red Lake River. Ahead of you is a large Cottonwood tree. Within the Old Crossing Treaty County Park, along the river just north of the boat ramp, is a large Cottonwood tree which was once used as a post office for early settlers. Oxcart drivers would collect or deposit letters in a box nailed to the tree as they passed through the area. The "Old Crossing" (Stop # 5) of the Red Lake River was near this tree. DIRECTIONS: Just before you leave the park is a statue of a Chippewa Indian, on your left. The Old Crossing Treaty memorial, a bronze life-size figure of a Chippewa Indian holding a peace pipe, was erected in 1932 by the U.S. government to commemorate the signing of a peace treaty with the Chippewa Indians in 1863. Representing the U.S. government was Alexander Ramsey, Minnesota's first Territorial Governor, who came from St. Paul escorted by a small detachment of U.S. soldiers. When Ramsey reached the Old Crossing, the Red Lake band of Chippewa were already there with their chiefs Mons-o-Mo, May-dwa-gun-on-ind, Little Rock, Broken Arm, and Leading Feather. Two days later the Pembina band arrived with Red Bear of Pembina and Little Chief of Turtle Mountain as their leaders. T. M. McCall writes in Centennial History of Polk County. "To Ramsey's chagrin, Charles Bottineau (a son of Pierre Bottineau), who escorted the Pembina Indians to the conference, had brought not only chiefs and head men as he had been directed, but also almost the whole body of Indians and half-breeds. . . So instead of a small group of leaders assembled on the grounds, they were thronged with more than sixteen hundred Indians and half-breeds." After two weeks of negotiations the Chippewa turned over millions of acres of fertile land in return for approximately $510,000. Pierre Bottineau was a guide for the expedition and served the Pembina band as interpreter in the negotiations. The ceded area is approximately 180 miles long, north and south, and approximately 127 miles wide, east and west, at the extreme length and width, containing approximately 11,000,000 acres according to Alexander Ramsey's estimate and report. For this tract the United States paid $510,000. Article One of the treaty reads as follows: "The peace and friendship now existing between the United States and Red Lake and Pembina bands of the Chippewa Indians shall be perpetual " . Thus the "Old Crossing" of the Red Lake River, where thousands of oxcarts passed, and where the making and signing of the Old Crossing Treaty occurred, is one of the outstanding historical places of Northwestern Minnesota and Northeastern Dakota, and the second day of October, 1863, has become and will remain an outstanding historical date for the states of Minnesota and North Dakota. DlRECTI0NS: As you leave the County Park drive along the river, continue past the cemetery up the hill to County Road 18 (paved). Turn east (right) and follow County Road 18 east and north to County Road 13. Continue east (straight) five miles on county Road 13. Just before you reenter Red Lake Falls watch for people "tubing" as you cross the bridge over the Red Lake River, Tubing is the most recent and imaginative use of the area's waterways. Voyageur's View Campground provides recreation to over 10,000 visitors a year. A good place to view the tubers is the County parking area on the left, just before the bridge. DlRECTIONS: From Stop # 10 proceed along County Road 13 to Highway 32 in Red Lake Falls. Turn left on Highway 32, go one block, then turn right onto County Road 1. Follow County Road one mile to St. Joseph's cemetery. The Bottineau grave site is near the cemetery entrance. If anyone person stands out in the early history of Red Lake Falls it is Pierre Bottineau. Born in 1817 in Red River country he was the son of a French man and a Chippewa woman. He learned the ways of the woods and prairies while a child trapping with his voyageur father . Fluent in French, English, Chippewa, Cree, Mandan and Winnebago, Bottineau worked for various agencies as interpreter and guide. In 1876 he, and two of his sons, came to what is now Red Lake Falls and staked a claim along the Clearwater river. He encouraged many French Canadians from St. Paul, Minnesota and the Red River Colony (Winnipeg, Manitoba, Canada) areas to settle here. He died in 1895 and was buried in the Cyr Cemetery west of Red Lake Falls. In 1978 his remains, and those of four members of his family, were moved to this site by the Red Lake County Historical Society. Alfonse F. Lambert and wife, Cesarie, both of Quebec, Canada, came to Lambert Township, Polk County, in 1881 to settle in Sec. 15. Here they built their home in what was to become the Village of Lambert. He assisted in the organization of the new township that bears his name and was a leader in founding St. Francis Xavier Catholic Church. The village grew from the year 1885 with the church, hotel, a blacksmith shop, post office, four stores and several homes. The family of Israel Gibeau and his wife, Elmire, migrated to this country about 1879 from Canada. He was a blacksmith and operated his shop in Lambert Town. Samuel Gibeau, son of Israel, opened a general store and became postmaster. When Red Lake County was formed in 1896, Sam Gibeau was elected first chairman of its Board of County Commissioners. The present Lambert Town Hall was built as the first school house in 1882. It is still in its present location, the SE corner of the SW corner of Section 10, located on Hwy. 92. The first teacher was Agnes Monpetit who later married Xavier Bergeron. This building was used as a school until 1904 when a new one was built. STOP #4. Oklee: Former home of Coya Knutson - First and Only Congresswoman from Minnesota home: 102 Main St.
"THE MINNESOTA FARMWIFE WHO TOOK WASHINGTON BY STORM"
In 1950 Mrs. Coya Knutson, a high school instructor in Oklee and the wife of a local farmer and hotel operator, was elected to the State Legislature where she served the people of the 65th District in Minnesota for three terms. 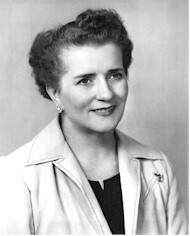 In 1956 she further distinguished herself and focused the attention of Oklee and the entire country by becoming the first woman from the State of Minnesota to be elected by the people of the 9th District to the Congress of the United States where she served for two terms in the House of Representatives. While there, her ceaseless and tireless efforts in helping to enact the National Defense Education Act, won for her the grateful appreciation of thousands of our young college students and their parents. The Act not only set up a student loan program which provided funds for promising~and needy college students who otherwise might find it impossible to attend school, but also funds to local schools, like Oklee, to help improve the learning and teaching situation. St. Francis Xavier Church was built in Lambert Township under the pastor Father J. Archambault. The structure measured 40 X 90 and the cost was $3,800. more improvements were made from 1932 until 1952 while Father Keough Patnode served as pastor. A parish kitchen and winter chapel were added, new pews and the pipe organ installed. The new rectory was built in 1958. In 1972 a new addition was built on the front of the church. Land for the first St. Francis Cemetery, chapel and rectory was donated by Pierre Belland in 1899 in the original location in the Town of Lambert. This cemetery was used until 1915 when land was donated by Joseph Bergeron for the new and present cemetery near the church. When the Soo Line Railroad surveyed a proposed route in 1909/ in preparation for laying the roadbed about two miles northeast of Lambert Town, Oklee was to become the shipping point for freight. The next few years were destined to bring about considerable building as new businesses located near the railroad. The school, stores and homes were moved from Lambert to the new town through about 1917. O.K. Lee had purchased land in 1909 and sold to the Tri-State Land Co. which had the new town site surveyed, platted and named Oklee. STOP # 6 OKLEE: OTHER ? ? ? STOP #13: Plummer - OTHER?? 1 All information for the sources of the names of places came from Minnesota Geographic Names , by Warren Upham, Minnesota Historical Society, reprint edition, 1969.